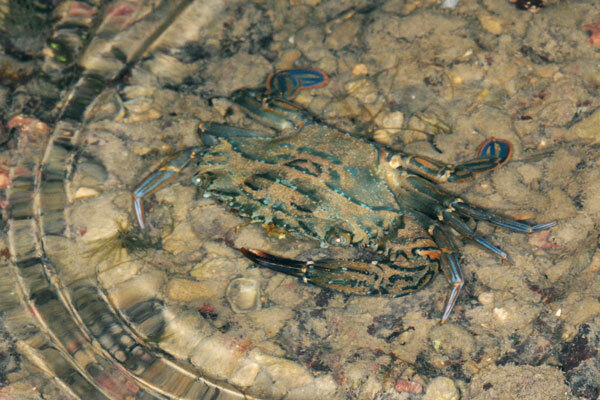 So many swimming crabs swimming around the shallow waters of Sentosa shore. They looked like they are playing catching with us. A small team head out early in the morning to check out the shore of Sentosa while another team when out for a recce trip for the upcoming Mega Marine Survey Southern Expedition. 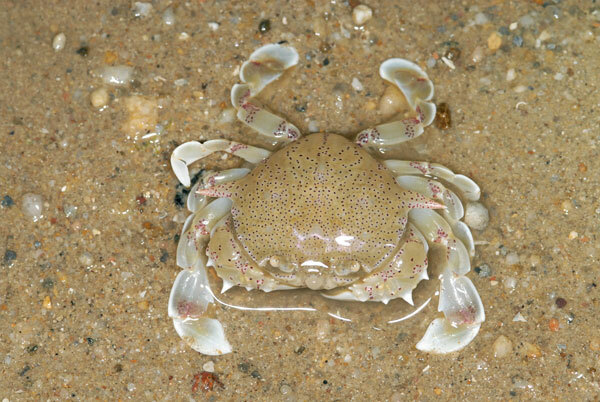 Other than the numerous swimming crab of various sizes, the Spotted moon crabs (Ashtoret lunaris) were also rather active today. Great match for the full moon in the sky. 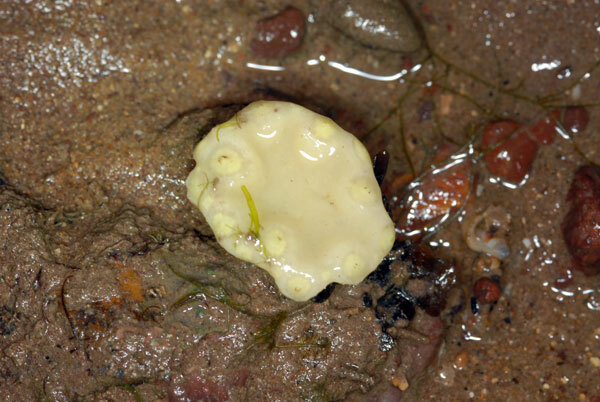 The moon crabs move quickly in the shallow water and they burrow in the sand very quickly. It was difficult to get one that stays still for a long time for you. 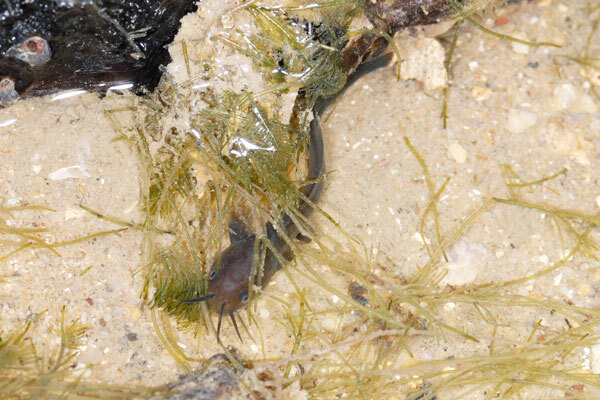 Other than the big crabs, there were also big and tiny hermit crabs scavenging on the shore. 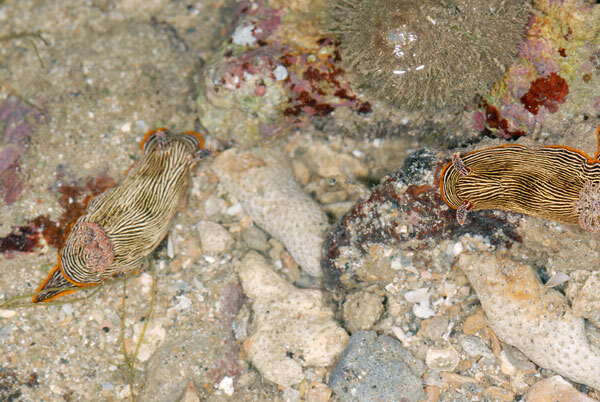 I only managed to find one Striped hermit crab (Clibanarius infraspinatus). 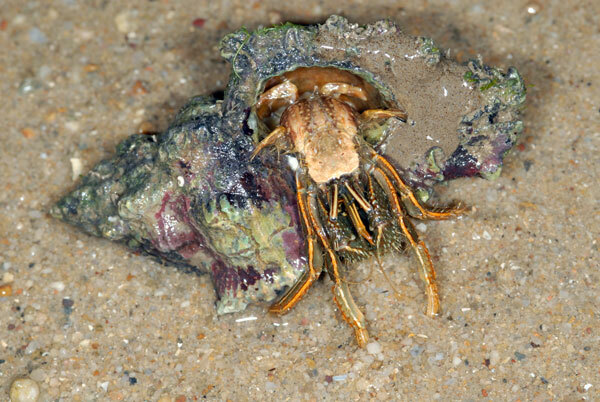 In this photo, you can see how the hermit crab uses its last pair of legs to hold onto the shell. Amazing animal. Only the head, pincers and walking legs of a hermit crab contains hard shell. 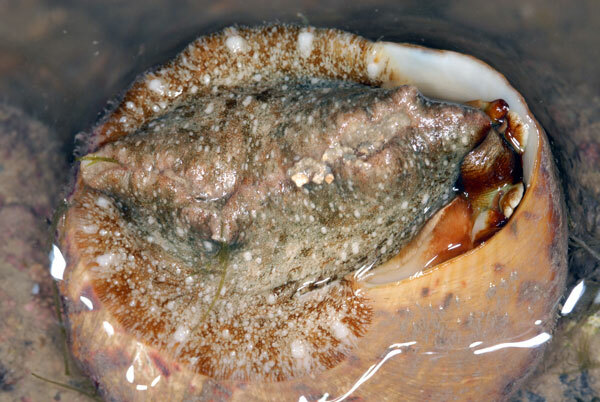 A layer of skin covers the body of the hermit crab and this skin is very fragile and easily dries up under direct heat. 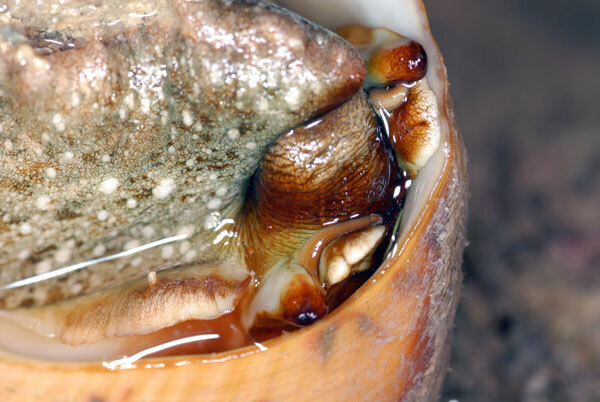 That is why the shell is very important in protecting the body of hermit crab. 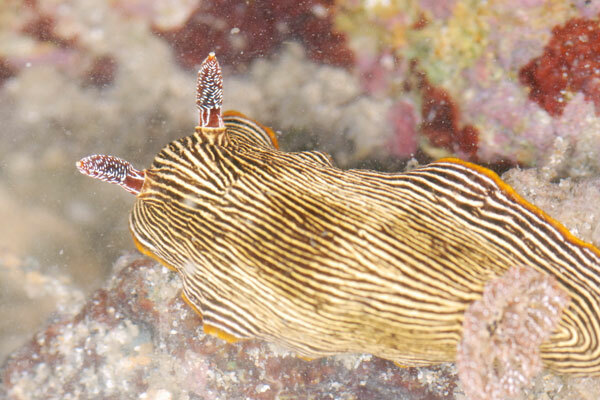 There was a live Giant top shell snail (Trochus niloticus). 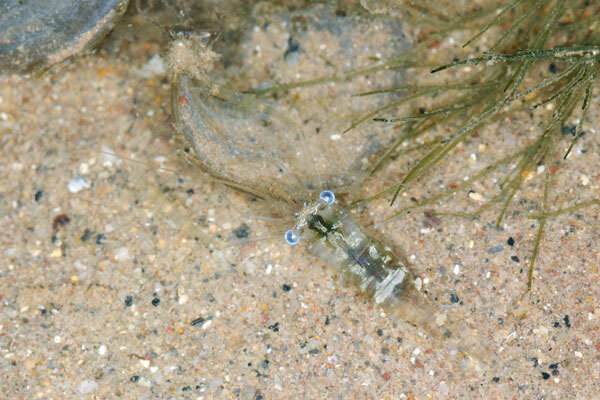 There were many tiny transparent shrimps with long pincers. 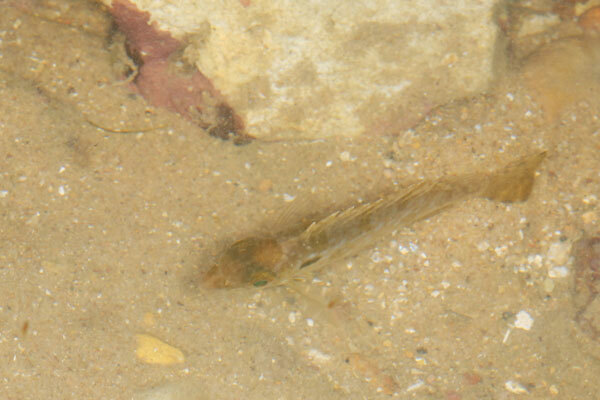 It was difficult to get a good photo of the shrimp in situ as the full outline of the shrimp is hardly visible in the photos. 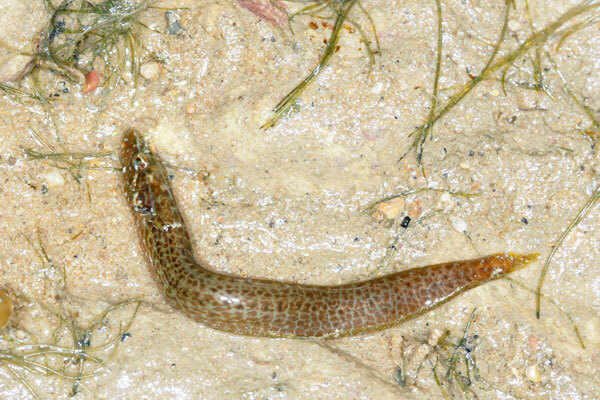 What is this eel like animal with yellow spots on its body? I am not sure as it was swimming and keeps going into hiding. This was the best image of it I got. 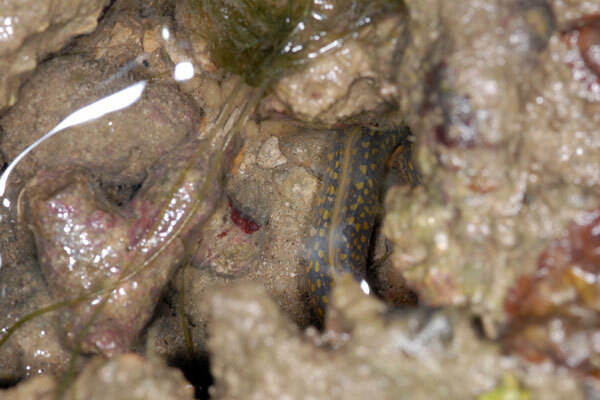 My guess is either a moray eel or eel-blenny. 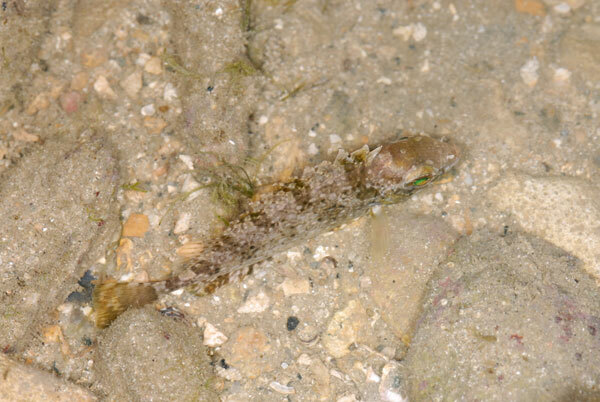 In the trip, I save a stranded juvenile Carpet eel-blenny (Congrogadus subducens) which probably skipped onto dry sand while wriggling around in a rather shallow pool. 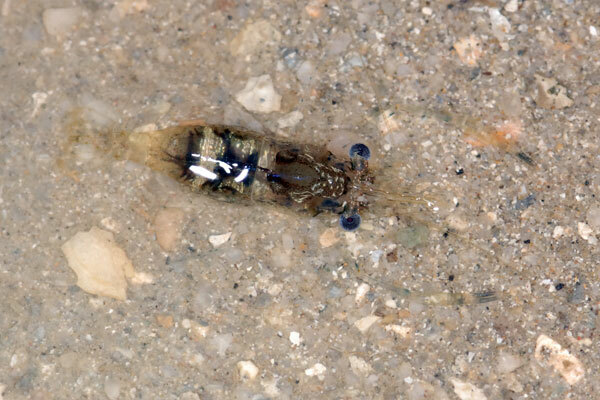 I gave it a push to help it get back into the shallow pool. 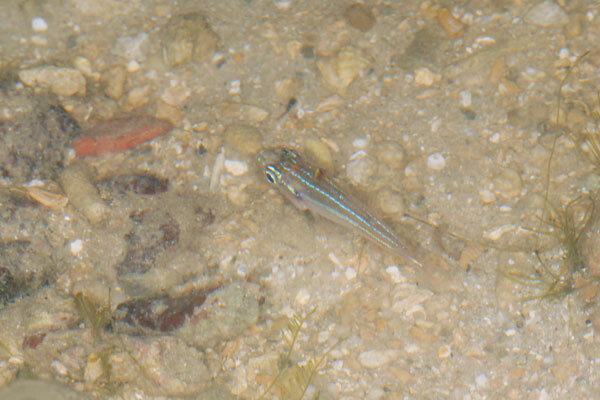 For a pre-dawn trip, it was easy to spot fish as they are less shy and more still for us to see. 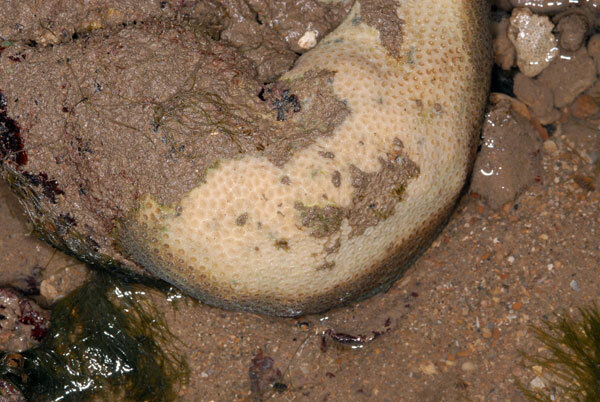 Oh dear, Ivan and I saw some of the corals bleaching. Most of them are partially bleached. I found one small colony that is fully bleached. Oh... 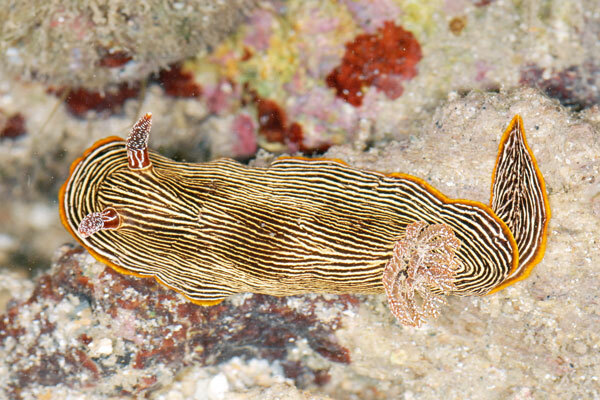 I spotted a pair of Lined chromodoris nudibranch (Chromodoris lineolata), the only nudibranch we saw in this trip. 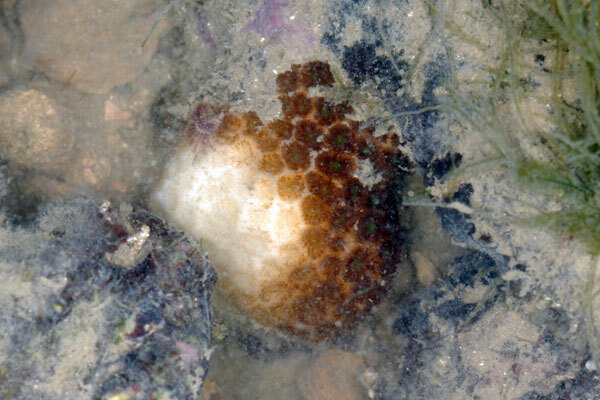 The nudibranch is rather small and I would have miss this if I had not looked closer. 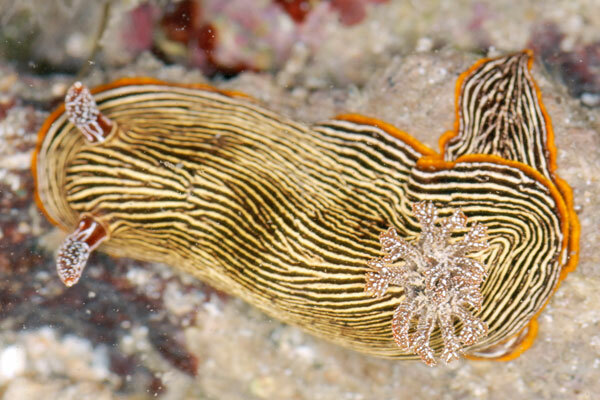 I probably missed many other nudibranchs on the shore. 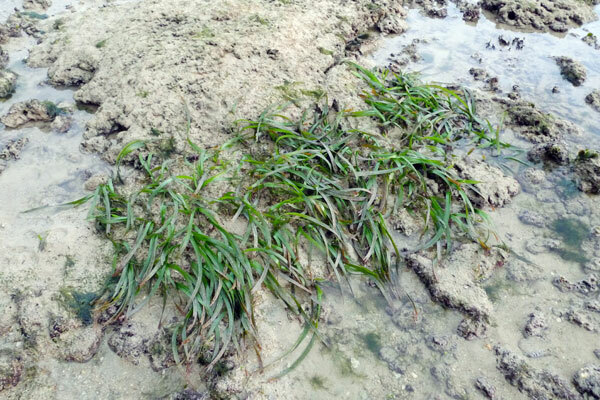 We spent most of the time one half of the shore and we end up with little time to check the other side on Tanjung Rimau. I did a quick walk through the shore while checking out the floating security barriers. 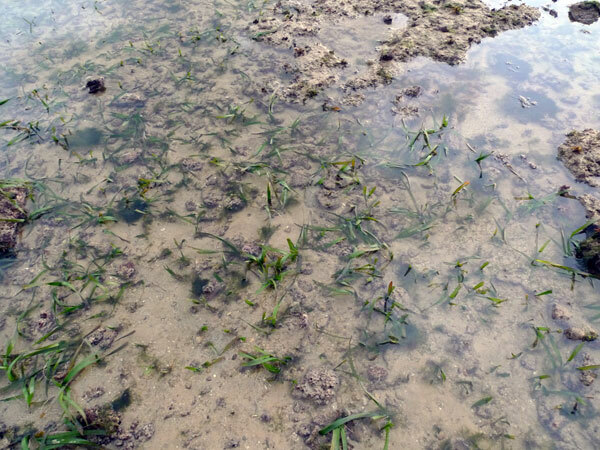 Most of the Tape seagrass (Enhalus acoroides) were long and grew rather well but there a few patched that were quite short but not as short or burnt as those I see at Cyrene. 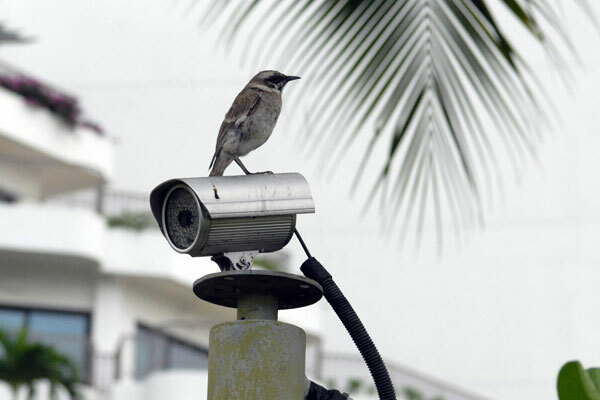 I have blogged about the floating security barriers in a separate post. Look! 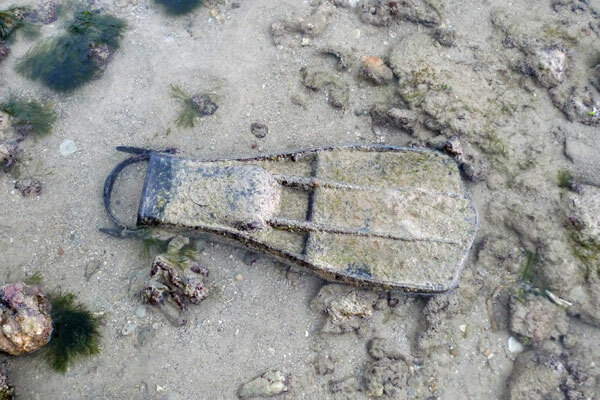 Some one lost one side of the scuba fins. 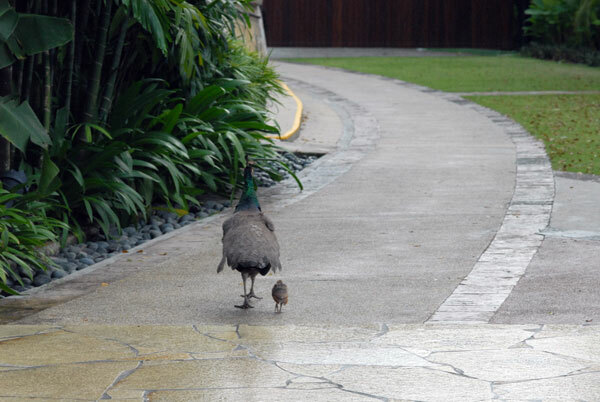 While heading to washup, Ivan and Marcus spotted an unknown bird while looking at the peafowl and her chick. We were blessed with great weather and a slight rain came when we were about to end out trip. 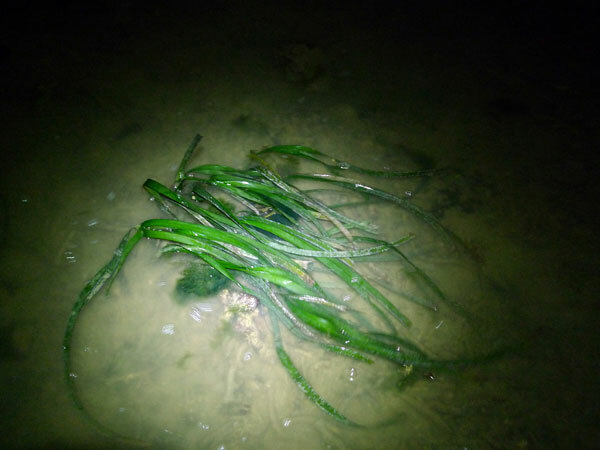 Read about what interesting animals the other team saw at a dual Terumbus trip in Ria's blog.